The end of the year is rapidly approaching (just where did 2013 go). I've just spend the week in Canberra at a very interesting meeting, but on the way down I actually thought I was off in to space. Why? Because the new Qantas uniform looks like something from Star Trek. Doesn't Qantas know what happens to red shirts? Anyway - why was I in Canberra? I was attending MaxEnt 2013, which, to give it its full name, was the 33rd International Workshop on Bayesian Inference and Maximum Entropy Methods in Science and Engineering. It was a very eclectic meeting, with astronomers, economists, quantum physicists, even people who work on optimizing train networks. So, what was it that brought this range of people together? It was the most important equation in science. Which equation is that, you may ask? It's this one. Huh, you may say. I've spoken about this equation multiple times in the past, and what it is, of course, is Bayes Rule. And now for a major paper from the Pan-Andromeda Archaeological Survey (PAndAS), led by astronomer-extraordinare Rodrigo Ibata. I've written a lot about PAndAS over the years (or maybe a year and a bit I've been blogging here) and we've discovered an awful lot, but one of the key things we wanted to do is measure the size and shape of the stellar halo of the Andromeda Galaxy. The stellar halo is an interesting place. It's basically made up of the first generation of stars that formed in the dark matter halo in which the spiral galaxy of Andromeda was born, and the properties of the halo are a measure of the formation history of the galaxy, something we can directly compare to our theoretical models. It's the 50th anniversary of both the assassination of John F. Kennedy and the first episode of Doctor Who, and yes, I did get up at 6:50 and watched The Day of the Doctor. So, today's post is about Time and Relative Dimensions in Space. Everyone loves a bit of relativity, even though its consequences can be quite mind-bending. Of course, one of the things that happens is that when things are moving relative to each other you get length contraction, and people disagree on how long something is. Length contraction is responsible for some cool physical effects, including explaining why two parallel currents attract one another. Check out this excellent video by Derek Muller on Veritasium which explains this. Another week has flown by and I don't know where the time went. But another good week in terms of research with a new paper accepted. This one is led by postdoctoral researcher, Nick Bate, with newly minted doctor, Anthony Conn, and PhD student, Brendan McMonigal. 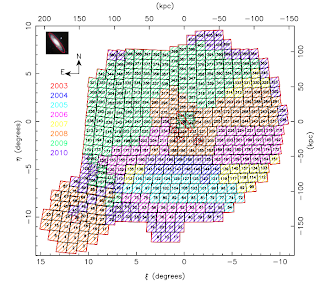 The focus of the study, substructure in the halo of the Andromeda Galaxy from, you guessed it, the rather fantastic Pan-Andromeda Archaeological Survey (PAndAS). The focus this time is a particularly prominent blob, known as the South-West Cloud (or, more colloquially to us, Japan). Here's a map of the substructure again. OK - I'll admit that the SW-Cloud doesn't look a lot like Japan, but the name stuck. Science has been in the news over the last week, and it's been quite a successful research week for me. But while science has been in the news, I'm not 100% impressed by the way it has been presented. Firstly, there was the lack of a dark matter detection by the Lux experiment. The reports around the web on this have been generally OK, but some have indicated that this is somehow a failure. But what is important, and is often not appreciated, is that in science the lack of a detection is as important as a detection. Negative results like this rule out possibilities and so are vital in cutting down the possibilities for what dark matter is. In fact, a lot of dark matter searches basically following the Holmes adage "eliminated the impossible, whatever remains, however improbable, must be the truth". Not seeing something increases our knowledge. I find myself a bit on an invalid for a couple of days, but have a mountain of stuff to get through so a brief post today. It doesn't take much digging about on the internet to find people who send a message to their previous self; don't worry, this is not about me writing a letter to a pimply version of myself warning of all of the mistakes I will make - it would make for a very long post! 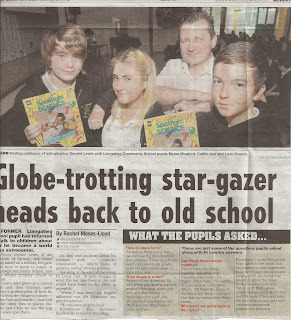 But when I was recently in Blighty, I was invited to visit a couple of my previous schools, namely Crynant Primary School and Llangatwg Comprehensive School and talk about my journey from the Welsh Valleys to being an astronomer at The University of Sydney. Visiting the schools was like traveling through time. Of course, things had changed, definitely more computers and smart boards than in my day, but the layout of the rooms brought back so many memories. The masses of Local Group dwarf spheroidal galaxies: Not too small after all? After a week of battling jet-lag, it's time to get back to some science. And this week, a new paper from the PAndAS, from Heidelberg based researcher, Michelle Collins. 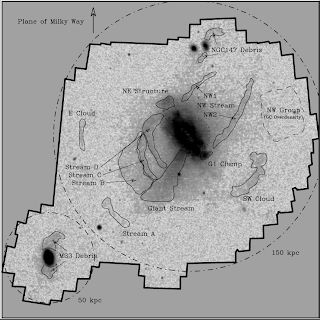 The target here is dwarf galaxies. Here's one from wikipedia. There's lots of dwarf galaxies out there in the Universe. In fact, in terms of number, they represent the dominant galaxies out there, but they are much smaller than our own Milky Way, so they don't have the dominant mass. Don't believe me? Well, my colleague, Alan McConnachie, recently compiled the most comprehensive compilation of the galaxies within our Local Group; you can read the details here. So, we have three large galaxies, the Milky Way, Andromeda and Triangulum, and then almost 100 smaller galaxies, a sea of dwarf galaxies. Apologies for the continued delays, but travels have come to an end, I find myself in a warm and sunny Sydney, and normal services will be resumed as soon as possible. A brief non-astronomy post. One of my other interests is history, especially prehistory, and on my break, myself and the family walks from Port Eynon to Rhossilli on the Gower Peninsula in Wales. This is very near where I grew up, but I never really explored it. It is a spectacularly beautiful piece of coast line, even in the sea fog. One of the reasons I wanted to visit was not only the beauty, but the history. A while ago, I bought a fantastic book called Homo Britannicus, detailing the prehistory of the British Isles.